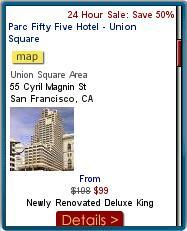 I’ve been pretty dissatisfied with most of the mobile hotel search and booking sites I’ve tried. I don’t know what it is about this category but hotel sites always seem to have serious usability problems; unnecessarily complex search forms, illogically sorted results, listings for hotels that turn out to have no availability, “bait and switch” pricing or prices buried several levels deep making comparison shopping unnecessarily complex. This week KeyToss launched a new mobile hotel booking service at h.keytoss.com. I’ve covered KeyToss before. It’s a personalized mobile homepage similar to iGoogle or NetVibes. I like KeyToss, it’s feature rich and enables adding a lot more types of content than the rather limited mobile versions of iGoogle and NetVibes. 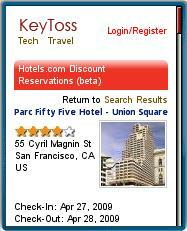 According to KeyToss their hotel site is “…the Most Advanced Hotel Booking Service on the Mobile Web”. That’s a bold claim and I approached the site skeptically but with high hopes. KeyToss is location enabled as much as is possible with current technology. It tries to use geolocation to find you so you don’t have to enter your location. KeyToss can geolocate on Android and Windows Mobile phones using Google’s Gears, BlackBerry’s with the BlackBerry browser’s built in location support and on the iPhone with the help of Alocola, a free open source app. KeyToss is not limited to the US either,covering 60 countries on five continents. Even without geoloacation it’s pretty easy to use KeyToss. The search form has only one required field, your location. If it hasn’t been prepopulated by geolocation it will accept your free form entry of a neighborhood, address, landmark, city, airport code, postal code or geo-coordinates. The rest of the search form is prepopulated with logical defaults; one room for tonight, rated at least two stars, under $250, for one person, for one night. All of those can of course be changed. The results seem to be mostly sorted by price, from lowest to highest. There doesn’t appear to be any way to change the sort to distance from your location, which given KeyToss’ geolocation ability, would be a great feature for trying to find a room at the last minute in an unfamiliar city. The listings include only available rooms with the lowest available base price for each hotel shown right in the initial listing along with a link to a map. Clicking on a particular hotel in the list of results will give the bottom line price, including taxes and fees, and considerable detail on each property; amenities, available services and pet and cancellation policies. 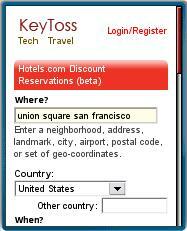 KeyToss iteself does not have a cancellation charge but individual hotels often do. KeyToss gets its inventory from Hotels.com and seems to have a huge number of properties available. A search for a room for tonight under $100 (which is considered very cheap) in downtown San Francisco returned 85 results including a $99 deal at a well located four star hotel! By default, KeyToss lists up to 100 results on a single page. These pages are large, about 200 KB when images are included. That”s fine for the iPhone, Opera Mini or even the BlackBerry, but is obviously too large for most feature phones. To deal with this and make the site work on all phones, KeyTossprovides an option to paginate the results, 15 to a page, and another to disable images. Pagination reduces page size to about 40 KB and turning off images drops it to 9 KB. With both options I was able to use KeyToss Hotels on an old RAZR with Motorola’s MIB browser and a couple low end Verizon LG phones running Openwave 6.2.3. However the Openwave 7.0 browsers of two Sprint/Nextel iDen Motorola phones claimed that even the 9 KB version of KeyToss was “Too large for available memory”. Which is surprising as the same phones could load other pages as large as 30 KB. Which looks like an Openwave bug as KeyToss seems to be doing everything right here. Booking a room with KeyToss is pretty easy too. If you have set up a profile with KeyToss in advance and included your credit card details you can book with just a click or two after signing in. If you haven’t registered there’s a click to call option. A discount code in each listing presumably insures that you will get the advertised price even if booking by phone. Finally you can book the old fashioned, non-mobile friendly way by filling out a typical 13 field form with name, address, phone number, card number, expiration date, security code, etc..
All in all, I think KeyToss lives up to it’s claim as being the most advanced mobile hotel booking site. It’s not perfect, I’d like to see it make better use of geolocation to identify the nearest hotels with vacancies and also use browser detection and adaptation to automatically deliver compatible results to all browsers. But the combination of a large inventory, ease of use and a format that encourages comparison shopping put it well ahead of the current competition. This entry was posted in Hotels and tagged Alocola, Gears, geolocation, Hotels, mobile site review by Dennis Bournique. Bookmark the permalink.